You can save the layout settings for individual users. To do this, choose Save settings. The detail reports are called with the initial variant. 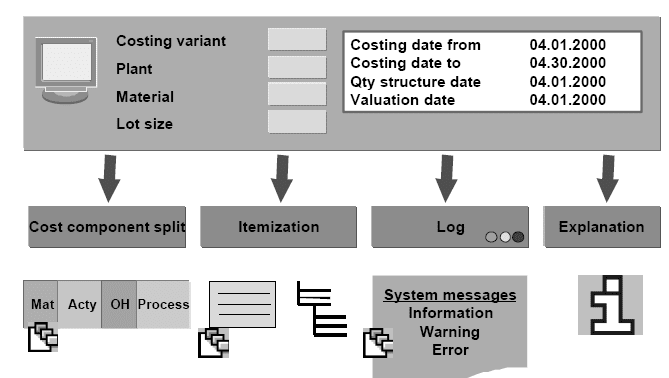 Error log: There are two options for analyzing the error messages of a cost estimate:Overall log: Contains the complete list of messages for all the materials costed. The error log contains display variants that enable you to carry out summarized analysis of the error(s).  If you double click on the material in the header of a cost estimate or in the status display, the messages are displayed. You can analyze the costing results with standard reports and display variants.You can use different cost component views for the costing results (such as the cost of goods manufactured or the cost of goods sold). Recommendation: Define your own display variants and initial variant. Use the navigational options to access reports. Navigate via the multilevel BOM to the reports and error logs. Whether the costs are rolled up (in other words, whether they appear in higher-level assemblies). Whether costs are included in the standard price or inventory price of the material. The views of the cost estimate or information system in which the costs appear. The cost component group to which the cost component is assigned. Whether it is relevant to inventory, cost of goods manufactured, and so on. Whether it should contain a total amount or whether there should be a fixed/variable split. A cost component structure is assigned to each costing variant.You can also assign different cost component structures for each company code and plant.For standard cost estimates (costing type 01), one cost component structure only is allowed per company code. 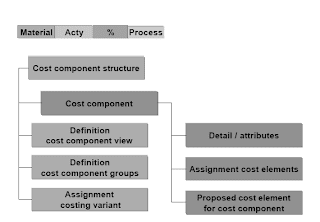 Similarly, one complete cost component structure must be used for cross-company code cost estimates. planning.You have determined the prices through planned price iteration. 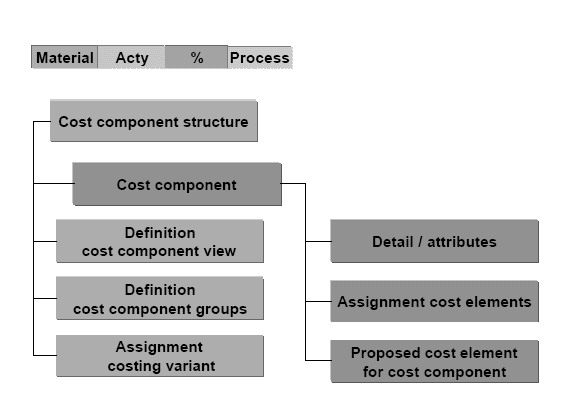 You have defined a cost component structure for the primary cost component split of Product Cost Planning.  You have defined a transfer structure for the transfer of the cost components in the cost centers and Activity-Based Costing to the cost components of the primary cost component split in Product Cost Planning. Example: There are three cost components in Cost Center Accounting for wage groups X, Y and Z.In Product Cost Planning, only the cost component for the wages is required. 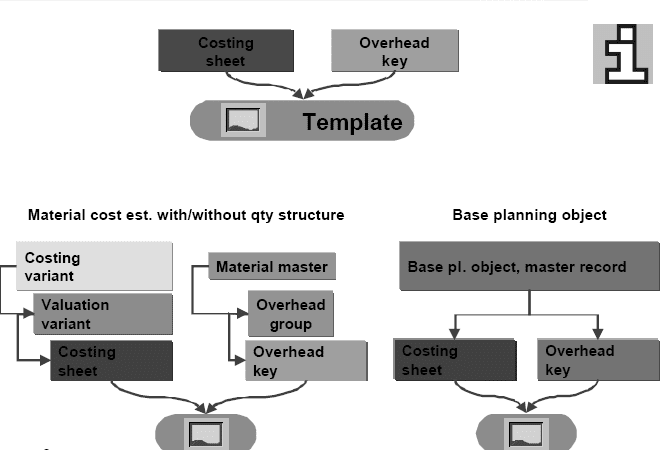 The transfer structure enables you to transfer cost components X, Y and Z into wages.When you create a material cost estimate, you can decide whether the system should create only a cost component split for the cost of goods manufactured, only a primary cost component split, or whether both splits should be created simultaneously. 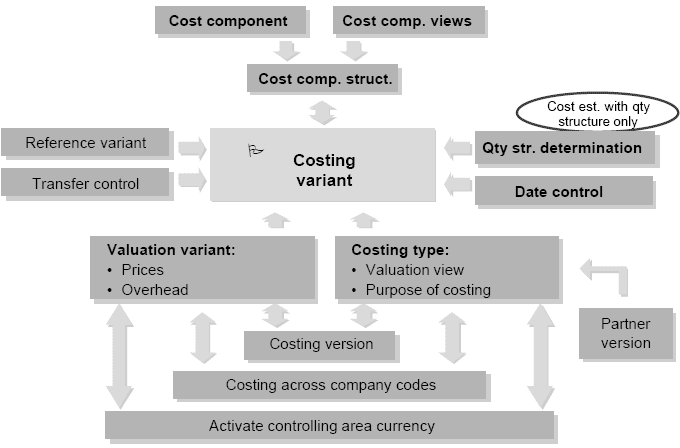 You make this choice when you assign the costing variants and enter the cost component structures for the main and auxiliary cost component splits. Quickly access data and information in the costing environment. Remain in the cost estimate or the analysis thereof while accessing the above data. object to be costed.You can access the facilities by choosing the Info icon in the cost estimate header.You can branch from the itemization, costed multilevel BOM and unit cost estimate list screen to the master data of the selected object(s).You also have the option of double -clicking to, for example, the costing variant in Customizing (in material costing). Material costing with quantity structure can allocate cost parts that are not contained in the BOM or routing. Identifying overhead blocks and their costs. Identifying causal, origin-based relationships with products that use these overhead blocks. The business process is one of the master data objects used in Activity-Based Costing.It is a measurement for output. Like cost centers, business process can be planned on cost accounting lines.The system can calculate a price for the output quantity of a business process. To determine the price, the system uses an allocation cost element that is stored in the business process master. 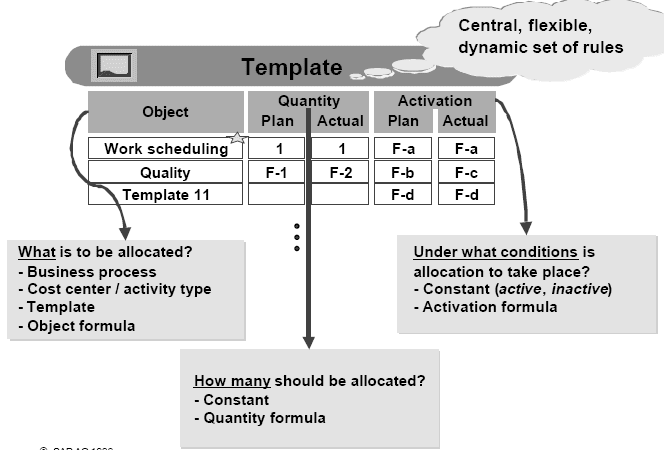 Templates are centrally-maintained tabular frameworks which are highly flexible and, through their use of formulas, dynamic. What is to be allocated? 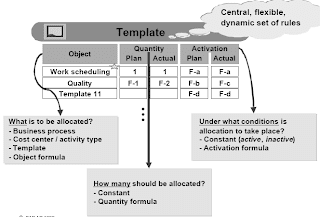 The Object column can contain business processes, cost centers/activity types, templates, or object formulas. Template in template: This function can be used to gain an overall view and to reuse the rules. How many should be allocated? The Quantity column is again divided into plan and actual quantities. The reason for this is that the planned and actual quantities to be allocated have different sources. (For example, the planned quantity could be the lot size, while the actual quantity could be the true quantity. )Under what conditions is the allocation to take place? The Activation column is divided into plan and actual. 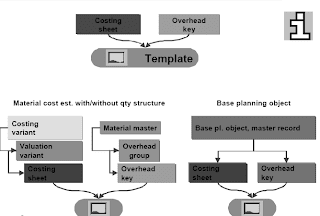 You can use the overhead key to specify whether the system finds one or various templates. Explanation facilities: When you execute a material cost estimate, you can display the system's interpretation of the template "rules" for the material, together with the values with which the formulas were called or returned. When you are in the display mode, you can only go to one of the templates found. Price control plays a crucial role in material valuation. When the price control indicator is set to S, the inventory is valuated at standard price. In addition, goods movements are valuated directly in the R/3 System using a price selected in accordance with the price control indicator.If the standard price was updated by a standard cost estimate, it can be used in Cost Object Controlling. 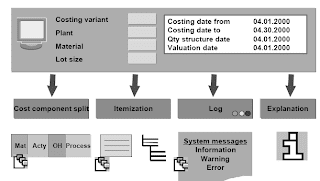 The system can use the itemization of standard cost estimates to determine the target costs for manufacturing orders. The difference between target cost and actual cost can be analyzed at the level of variance categories, such as quantity or price variances. The saved itemization provides the basis for the variance calculation. In Profitability Analysis , you can use standard cost estimates (or other material cost estimates) to compare the revenues of the billed quantity with the cost component split of the product.A standard price is also required in the Material Ledger to determine the actual price.  The result of the standard cost estimate as the standard price.  The results of the modified standard cost estimate or the current cost estimate as planned prices 1, 2 and 3.  The results of the inventory cost estimate as commercial prices 1, 2 and 3 or tax-based prices 1, 2 and 3. In the valuation strategy, you can refer to different prices in the material master so that you can use these prices in other cost estimates.The standard price is updated in the material master in two steps:  Marking a standard cost estimate  Releasing a standard cost estimate.